The cooking time for the grain can vary depending on the brand, but in the end it's all worth it. 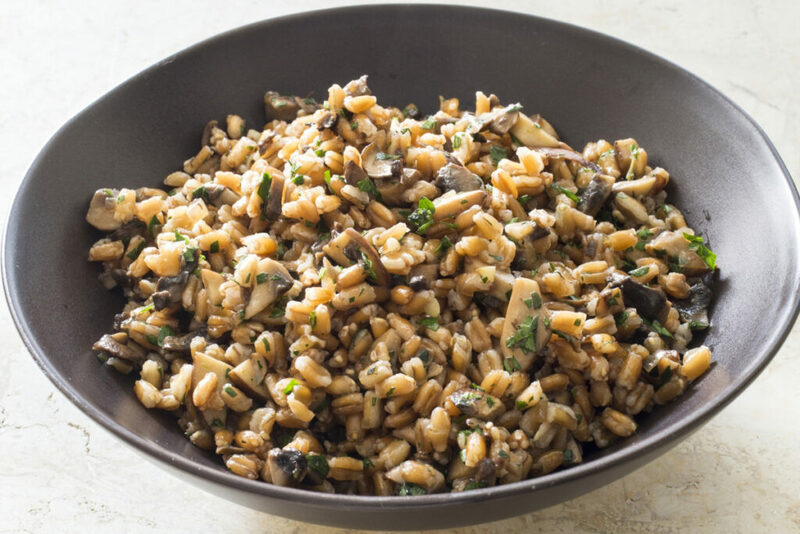 Warm farro with mushrooms is one of those dishes you simply look at and you can hear your tummy pleading, "Yes, yes, yes." Only takes an hour to prepare and as for the diet, not bad. Not bad at all. Scraping up the browned bits in the pan with sherry rounded things out with sweetness and acidity before we added the farro. We prefer the flavor and texture of whole farro; pearled farro can be used but the texture may be softer. Do not use quick-cooking or pre-steamed farro (read the ingredient list on the package to determine this) in this recipe. The cooking time for farro can vary greatly among different brands, so we recommend beginning to check to see if it’s done after 10 minutes. Bring 4 quarts water to boil in a large pot. Add farro and 1 teaspoon of salt and cook until the grains are tender with a slight chew, 15 to 30 minutes. Drain farro, return to now-empty pot, and cover to keep warm. Heat 2 tablespoons oil in 12-inch skillet over medium heat until shimmering. Add mushrooms, shallot, thyme, and 1/4 teaspoon salt and cook, stirring occasionally, until moisture has evaporated and vegetables start to brown, 8 to 10 minutes. Stir in sherry, scraping up any browned bits, and cook until skillet is almost dry. Add farro and remaining 1 tablespoon oil, and cook until heated through, about 2 minutes. Off heat, stir in parsley and vinegar. Season with pepper and extra vinegar, to taste and serve.